India’s blooming relationship with Israel also encompasses trade, agriculture, technology, and tourism. Indian Prime Minister Narendra Modi’s visit to Israel in July 2017, in a year which marks the 25th anniversary of diplomatic ties, will be closely observed, not just in the two national capitals, but far beyond. That’s only fitting, since Modi’s trip will have significant ramifications. Even though India and Israel established diplomatic relations 25 years ago, Modi’s visit is the first by an Indian prime minister to Israel. Modi’s planned trip follows a similar visit by the president of India in 2015 and reciprocal visit to India by Israel’s president in 2016. In the past 25 years, the divergence between both countries have been considerably reduced, for a number of reasons. Improvement in India’s ties with the United States, along with the reduction of tensions between Arab states and Israel in recent years, are of course significant factors. 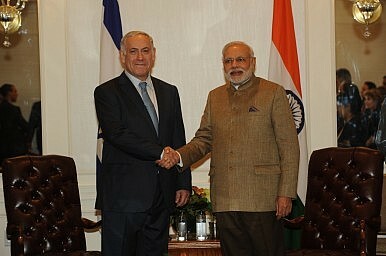 The India-Israel bilateral relationship has witnessed massive strides, and not just in the most-watched area of defense. Trade is estimated at $5 billion (not including defense agreements) and Israeli foreign direct investment (FDI) in India over the past decade and a half (between 2000-2016) is estimated at over $100 billion. Cooperation in other spheres, like agriculture and education, has also witnessed a significant rise. This is not to say that there is no friction. The elephant in the room remains Iran. Ties between Tel Aviv and Tehran have been strained, while New Delhi has a strong economic and strategic relationship with Iran. During Modi’s visit to Iran in May 2016, an agreement was signed for the joint development of Chabahar port, promising deeper-still cooperation. Israeli Ambassador to India Daniel Carmon, who has been openly pitching a more robust relationship with India, has been quite forthright about differences between India and Israel on this issue. There is one point that maybe we haven’t stressed in the past years — the knowledge of each other. India and Israel do not know each other enough. Tourism is important in this. Strengthening the academic links, strengthening the cultural ties, having more students studying here [in India] and there [in Israel]. While the political leadership should get a large share of the blame for this, large sections of the intelligentsia in India too are responsible. While in private they are not averse to people-to-people interactions and links between intellectuals, in public some have taken extremely rigid positions. As a result of minimal interactions, a miniscule percentage of Indians are aware of Israel’s impressive achievements in areas like agriculture, or even the cooperation between both countries in this sphere. In India, public perceptions of the relationship with Israel largely center on the defense cooperation between both sides. Israel happens to be India’s third largest arms supplier (at estimated value of $1 billion). A number of key agreements in the defense field are likely to be finalized before the prime minister’s visit in July 2017. They include the purchase of Spike anti-tank missiles for India’s army and Barak-8 air defense missiles for the Indian navy. Defense cooperation is obviously the most important factor in today’s India-Israel relationship, but certainly not the only one. Few are aware of the agricultural cooperation between both countries, which has been going on for a decade. The strongest instance of this are the Centers of Excellence, which were begun in 2009 and now exist in a large number of Indian states. More Centers of Excellence are likely to be set up. One of the interesting collaborations between Israel and India in the agriculture sphere is the Olive Plantation Initiative in Rajasthan. Plus, a number of states, the most recent example being Punjab, are keen to seek Israeli assistance in drip irrigation. Irrespective of the political affiliation of the party in power, states have welcomed such cooperation. Another area, where India could learn from Israel is IT start-ups. Modi has sought to give a push to India in the sphere of technology, while also encouraging start-ups. During his meeting with Israel’s agriculture minister on the sidelines of the Vibrant Gujarat Summit in January 2017, Modi said India was also keen to learn from the start-up ecosystem of Israel and its incubation centers. Tel Aviv has been ranked as number five in the world in terms of providing an ecosystem for entrepreneurs. Dan Senor and Saul Singer’s 2009 book Start-up Nation: The Story of Israel’s Economic Miracle has brought to the fore reasons for Israel’s success in this sphere. At a time when a large number of countries are becoming more insular and imposing visa restrictions — with IT professionals being the biggest sufferers — the need for focusing on start-ups, especially in IT, is even more important. Modi’s start-up program, along with his emphasis on technology, is an important beginning. Cities like Bengaluru have been able to create a start-up culture, but it is often remarked that this is in spite of the government, not because of it. Israel can provide important lessons to India. There are other areas too where both countries can enhance their cooperation. While in the area of education, exchanges between both sides are steadily rising, they remain way below the true potential. As of 2016, one-tenth of foreign students in Israel were from India. During the Israeli president’s 2016 visit to India, a number of MOUs were signed to further enhance educational exchanges. A large number of Indian Jews originally hail from Maharashtra, and there is a growing interest in the Marathi language. The number of tourists from India to Israel has witnessed an increase. In 2016, over 40,000 Indians visited Israel. India has been focusing on this aspect, and since 2015 efforts have been made to attract more Israeli tourists, especially those of Indian origin. An increase in the number of flights will give a spurt to tourism exchanges. In his three years in office, Modi has focused a lot on foreign policy. He has particularly emphasized using soft power, greater people-to-people contact, and greater state-to-state diplomacy to further relations. He should ensure that all three are used effectively used to boost India-Israel ties. Tridivesh Singh Maini is a New Delhi based Policy Analyst associated with the Jindal School of International Affairs, OP Jindal Global University, Sonipat.